Regardless of brands and its frequency, DRAM memory modules has always been one of the core components for a system to be able to function. As the trend is shifting towards the aesthetics of having all the fancy lightings in a PC, memory manufacturers has come up with different variety of memory modules that comes with different colors of LED to meet the end-user’s demand. The Apacer BLADE FIRE DDR4 we have here today is the one of Apacer’s gaming memory that comes with RED colored LED, based on its non-LED counterpart, the Blade DDR4. Other than the aesthetics offered, let’s find out just what kind of performance this kit can deliver – will it be a yay or nay? At first glance, the BLADE FIRE DDR4 ships in a pretty attractive package with a flaming Blade DDR4 and a cutout window at the front for product showcase. There’s nothing much interesting at the back of the package though. All you’ll find here is some brief description of the memory kit, i.e high frequency, low voltage, LED lightings, etc. Design wise, the BLADE FIRE DDR4 looks pretty much the same as the Blade DDR4. As its name suggests, we can see a blade like design on the saber-shaped heat spreader which Apacer boats of its excellent heat dissipation. The part that differentiate the BLADE FIRE DDR4 from its non-LED counterpart is the red translucent bar for the red LED lightings. The aluminum bar as seen on the Blade DDR4 has been replaced with the red translucent bar for the LED lightings. It’s pretty obvious that it will definitely have an effect on the heat dissipation, but that’s the sacrifice you’ll have to make for sake of the aesthetics. As the LED on the BLADE FIRE DDR4 is red in color, it’ll make a good match for those of you who has a system with red-black theme. Running the system without enabling the XMP profile doesn’t land us on the 2133MHz that we’re familiar with, but instead, a 2400MHz on default. 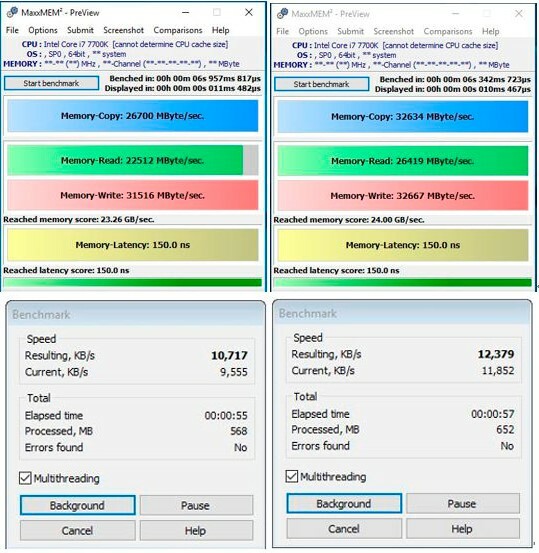 Enabling the XMP will get you straight to 3000MHz without any adjustment to the memory timings and relevant voltage. 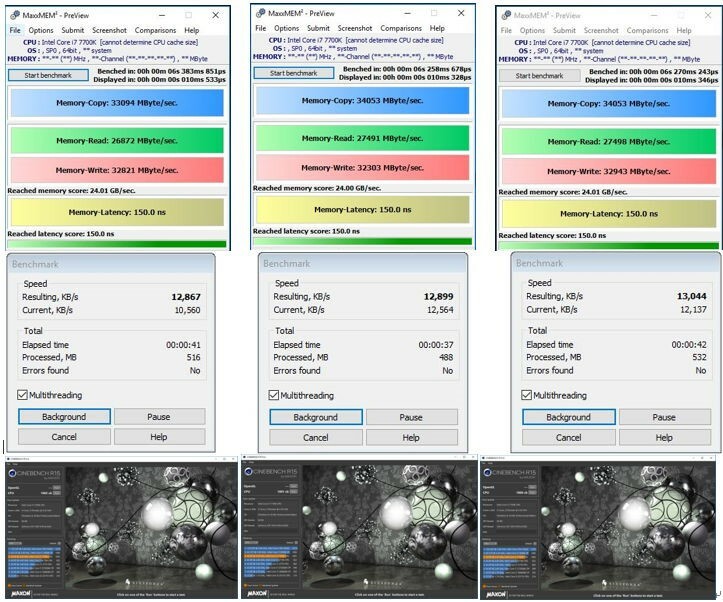 We have compared the performance via synthetic benchmark, Cinebench R15, there are noticeable improvement in the score with the memory frequency raised from 2400MHz to 3000MHz. Other than Cinebench R15, the performance improvement can be seen via MaxxMEM as well. With memory-copy (22.22%) and memory-read (17.35%) showing the most significant result from that extra 600MHz boost on the memory frequency. WinRAR is one of the most used data compression tool similar to WinZIP, 7zip. In case if some of you didn’t notice this, WinRAR comes with a built-in benchmark tool for the enthusiasts to monitor their system performance. From 2400MHz to 3000MHz, we can notice that the the performancce score has improved by 15.5%. While there are reviews that shows higher frequency memory kit gives only a minimal impact to games, the numbers you’re seeing there aren’t actually telling the whole story. Not for what we’ve observed with DDR4 memory kit of course. While the result might not be showing a very big boost in terms of the average FPS, we can actually see that the Minimum FPS is doing better when the its running on 3000MHz. For games that requires you to move around and changing direction of your view in a fast pace, higher frequency memory definitely helps to reduce the FPS fluctuation to ensure smoother gameplay. Moving on with the overclocking, we manage to push the BLADE FIRE DDR4 to 3466MHz without adjusting any of the memory secondary timings. 3600MHz is possible, but due to the limitation of our CPU here, we weren’t able to get it stable enough to survive through the benchmarks we’ve run for this review. As we never raised the CPU frequency throughout the test, we can notice that the performance numbers started to increase in a slower pace even though we have been constantly raising the memory frequency. To be honest, we’re a little skeptical when we first unboxed the BLADE FIRE DDR4 but turns out that we’re wrong on that. The BLADE FIRE DDR4 managed to went beyond its 3000MHz as rated on its XMP to 3466MHz without requiring any adjustsments to its secondary timing. As mentioned earier, we managed to push it a little further to 3600MHz without any adjustments to the secondary timing, but it wasn’t able to survive all of the test that we’ve done for this review due to the limitation of our CPU. If you’re looking for a good looking DDR4 memory kit that doesn’t comes with just the appearance, the BLADE FIRE DDR4 will definitely not disappoint you with the performance it can deliver. please do a run with Ryzen if it can go beyond the rated freq.